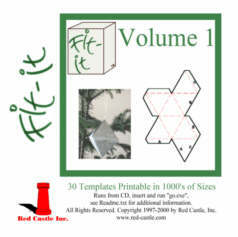 Click here to see a complete list of the templates include in Fit-It Volume 1 CDROM. Vamp Stamp News(VSN) April 2000 Review of Fit-It. Tutorial on How to Use Fit-It works and to how easy it is to use. Red Castle Projects Designed by Judi Kauffman many of these projects show wonderful examples of using Fit-It templates in your projects. Fit-It Volume 1 Demo Version is available for downloading, to let you see how the program works. The file is approx. 658KB. 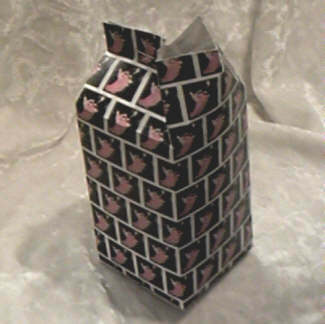 The template in the Demo Version is a "Milk Carton" that can be sized and shaped as the 30 templates in Fit-It Volume 1 can be. The Milk Carton is not a template on the Fit-It Volume 1 cdrom. THE TEMPLATES DOWNLOADED MAY NOT BE SOLD OR GIVEN AWAY OR REPRODUCED IN ANY WAY. IT maybe be used in classes if the Fit-It cdrom is shown to the class, and they are told were they can purchase the cd. Price is $39.95 in USA Funds, Visa, MasterCard, AmercianExpress credit cards. Shipping is $3.55 to US addresses.